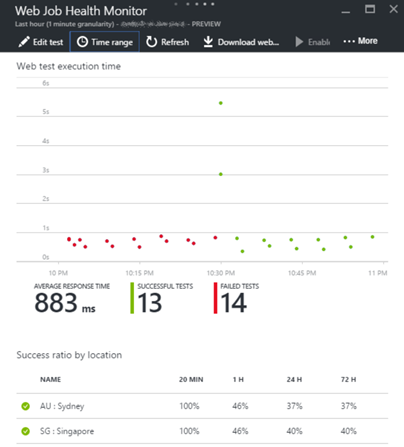 Application Insights is a component of Azure Monitor for application-level instrumentation. 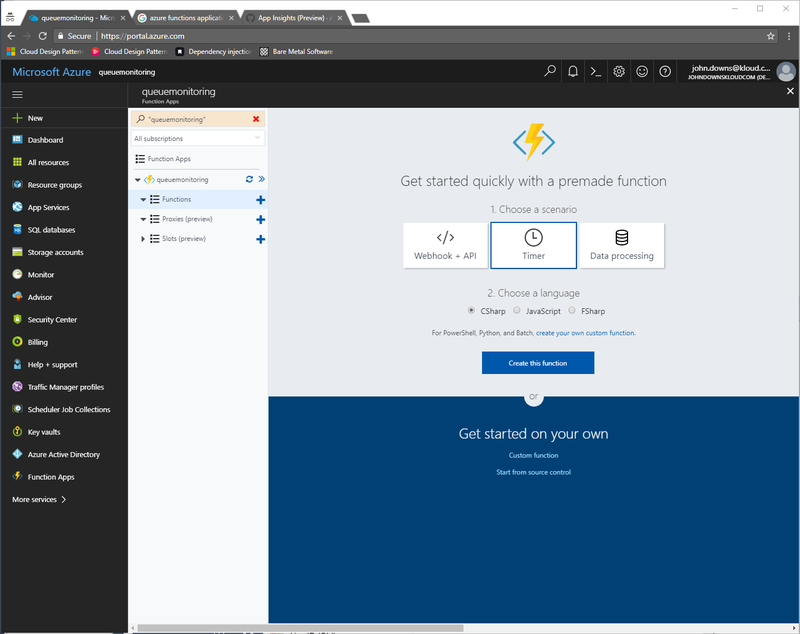 It collects telemetry from your application infrastructure like web servers, App Services, and Azure Functions apps, and from your application code. In this post we’ll discuss how Application Insights can be automated in several key ways: first, by setting up an Application Insights instance in an ARM template; second, by connecting it to various types of Azure application components through automation scripts including Azure Functions, App Services, and API Management; and third, by configuring its smart detection features to emit automatic alerts in a configurable way. As this is the first time in this series that we’ll deploy instrumentation code, we’ll also discuss an approach that can be used to manage the deployment of different types and levels of monitoring into different environments. 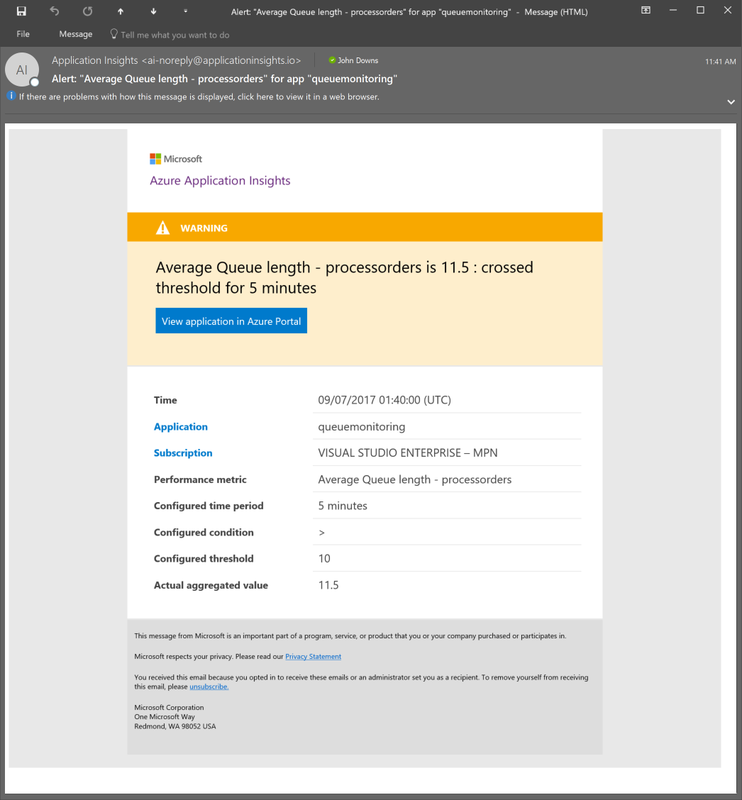 Part 2 (this post) describes Azure Application Insights, including its proactive detection and alert features. It also outlines a pattern for deploying instrumentation components based on the requirements we might typically have for different environments, from short-lived development and test environments through to production. When using the Azure Portal or Visual Studio to work with various types of resources, Application Insights will often be deployed automatically. This is useful when we’re exploring services or testing things out, but when it comes time to building a production-grade application, it’s better to have some control over the way that each of our components is deployed. Application Insights can be deployed using ARM templates, which is what we’ll do in this post. Application Insights is only available in a subset of Azure regions. This means you may need to deploy it in a region other than the region your application infrastructure is located in. The template above includes a parameter to specify this explicitly. The name of your Application Insights instance doesn’t have to be globally unique. Unlike resources like App Services and Cosmos DB accounts, there are no DNS names attached to an Application Insights instance, so you can use the same name across multiple instances if they’re in different resource groups. Application Insights isn’t free. If you have a lot of data to ingest, you may incur large costs. You can use quotas to manage this if you’re worried about it. There are more options available that we won’t cover here. This documentation page provides further detail. After an Application Insights instance is deployed, it has an instrumentation key that can be used to send data to the correct Application Insights instance from your application. The instrumentation key can be accessed both through the portal and programmatically, including within ARM templates. We’ll use this when publishing telemetry. 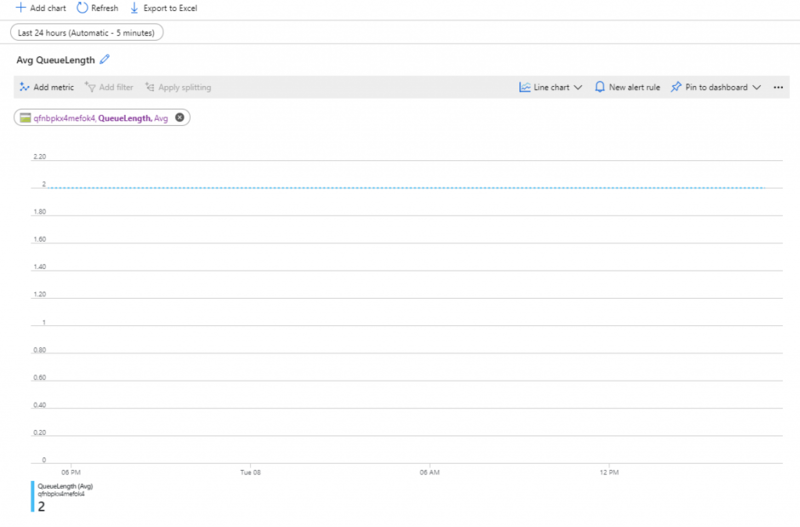 There are a number of ways to publish telemetry into Application Insights. While I won’t cover them all, I’ll give a quick overview of some of the most common ways to get data from your application into Application Insights, and how to automate each. If we’re deploying a web app into an app service using ASP.NET, we can use the ASP.NET integration directly. In fact, this works across many different hosting environments, and is described in the next section. 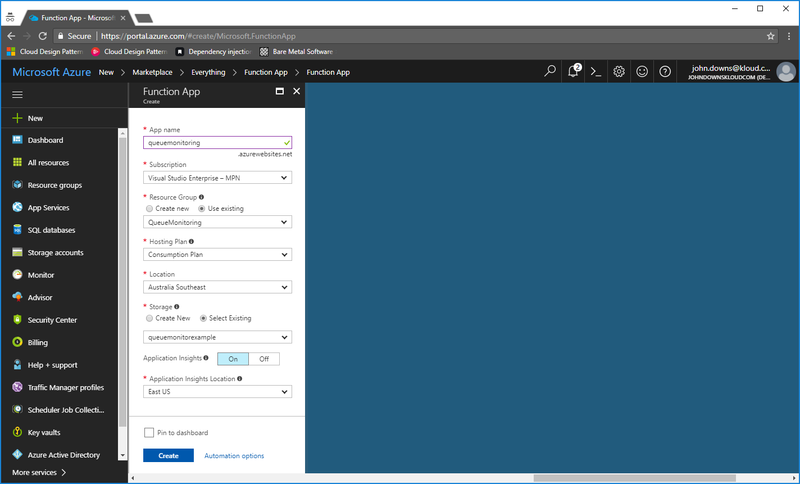 As you can see, similarly to the Azure Functions example, the APPINSIGHTS_INSTRUMENTATIONKEY is used here to link the app service with the Application Insights instance. One word of warning – I’ve found that the site extension ARM resource isn’t always deployed correctly the first time the template is deployed. If you get an error the first time you deploy, try it again and see if the problem goes away. I’ve tried, but have never fully been able to understand why this happens or how to stop it. If you have an ASP.NET application running in an App Service or elsewhere, you can install a NuGet package into your project to collect Application Insights telemetry. This process is documented here. If you do this, you don’t need to install the App Services extension from the previous section. Make sure to set the instrumentation key in your configuration settings and then flow it through to Application Insights from your application code. If you have an Azure API Management instance, you might be aware that this can publish telemetry into Application Insights too. This allows for monitoring of requests all the way through the request handling pipeline. 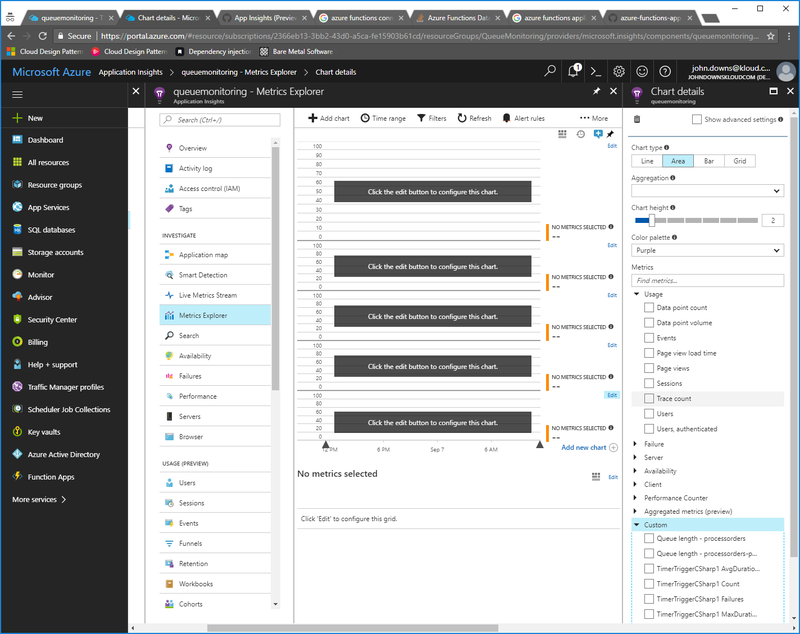 When it comes to automation, Azure API Management has very good support for ARM templates, and its Application Insights integration is no exception. At a high level there are two things we need to do: first, we create a logger resource to establish the API Management-wide connection with Application Insights; and second, we create a diagnosticresource to instruct our APIs to send telemetry to the Application Insights instance we have configured. We can create a diagnostic resource for a specific API or to cover all APIs. The diagnostic resource includes a sampling rate, which is the percentage of requests that should have their telemetry sent to Application Insights. There is a lot of detail to be aware of with this feature, such as the performance impact and the ways in which sampling can reduce that impact. We won’t get into that here, but I encourage you to read more detail from Microsoft’s documentationbefore using this feature. An application suddenly sends back a higher rate of 5xx (error)-class status responses than it was sending previously. The time it takes for an application to communicate with a database has increased significantly above the previous average. Of course, this feature is not foolproof – for example, in my experience it won’t detect slow changes in error rates over time that may still indicate an issue. Nevertheless, it is a very useful feature to have available to us, and it has helped me identify problems on numerous occasions. Smart detection is enabled by default. Unless you configure it otherwise, smart detection alerts are sent to all owners of the Azure subscription in which the Application Insights instance is located. In many situations this is not desirable: when your Azure subscription contains many different applications, each with different owners; or when the operations or development team are not granted the subscription owner role (as they should not be! ); or when the subscriptions are managed by a central subscription management team who cannot possibly deal with the alerts they receive from all applications. We can configure each smart detection alert using the proactiveDetectionConfigs ARM resource type. In development environments, you may not want to have these alerts enabled at all. Development environments can be used sporadically, and can have a much higher error rate than normal, so the signals that Application Insights uses to proactively monitor for problems aren’t as useful. I find that it’s best to configure smart detection myself so that I can switch it on or off for different environments, and for those environments that do need it, I’ll override the alert configuration to send to my own alert email address and not to the subscription owners. This requires us to have different instrumentation configuration for different environments. In most real-world applications, we end up deploying the application in at least three environments: development environments, which are used by software developers as they actively work on a feature or change; non-production environments, which are used by testers, QA engineers, product managers, and others who need to access a copy of the application before it goes live; and production environments, which are used by customers and may be monitored by a central operations team. Within these categories, there can be multiple actual environments too – for example, there can be different non-production environments for different types of testing (e.g. functional testing, security testing, and performance testing), and some of these may be long-lived while others are short-lived. Production environments typically need the highest level of alerting and monitoring since an issue may affect our customers’ experiences. We’ll typically have many alerts and dashboards set up for production systems. But we also may not want to collect large volumes of telemetry from production systems, especially if doing so may cause a negative impact on our application’s performance. Non-production environments may need some level of alerting, but there are certain types of alerts that may not make sense compared to production environments. For example, we may run our non-production systems on a lower tier of infrastructure compared to our production systems, and so an alert based on the application’s response time may need different thresholds to account for the lower expected performance. But in contrast to non-production environments, we may consider it to be important to collect a lot of telemetry in case our testers do find any issues and we need to diagnose them interactively, so we may allow for higher levels of telemetry sampling than we would in a production environment. Development environments may only need minimal instrumentation. Typically in development environments I’ll deploy all of the telemetry collection that I would deploy for non-production environments, but turn all alerts and dashboards off. In the event of any issues, I’ll be interactively working with the telemetry myself anyway. Once we’ve determined those basic rules, we can then implement them. In the case of ARM templates, I tend to use ARM template parameters to handle this. As we go through this series we’ll see examples of how we can use parameters to achieve this conditional logic. I’ll also present versions of this table with my suggestions for the components that you might consider deploying for each environment. Now that we have a basic idea of how we’ll configure instrumentation in each environment, we can reconsider how we might configure Application Insights. Typically I suggest deploying a single Application Insights instance for each environment the system will be deployed into. If we’re building up a complex ARM template with all of the system’s components, we can embed the conditional logic required to handle different environments in there. Application Insights is a very useful tool for monitoring our application components. It collects telemetry from a range of different sources, which can all be automated. It provides automatic analysis of some of our data and has smart detection features, which again we can configure through our automation scripts. Furthermore, we can publish data into it ourselves as well. In fact, in the next post this series, we’ll discuss how we can publish custom metrics into Application Insights. Instrumentation and monitoring is a critical part of managing any application or system. By proactively monitoring the health of the system as a whole, as well as each of its components, we can mitigate potential issues before they affect customers. And if issues do occur, good instrumentation alerts us to that fact so that we can respond quickly. Part 1 (this post) provides an introduction to the series by describing why we should instrument our systems, outlines some of the major tools that Azure provides such as Azure Monitor, and argues why we should be adopting an ‘infrastructure as code’ mindset for our instrumentation and monitoring components. While the posts will cover the basics of each of these topics, the focus will be on deploying and automating each of these components. I’ll provide links to more details on the inner workings where needed to supplement the basic overview I’ll provide. Also, I’ll assume some basic familiarity with ARM templates and PowerShell. Let’s start by reviewing the landscape of instrumentation on Azure. As Azure has evolved, it’s built up an increasingly comprehensive suite of tools for monitoring the individual components of a system as well as complete systems as a whole. The key piece of the Azure monitoring puzzle is named, appropriately enough, Azure Monitor. Azure Monitor is a built-in service that works with almost all Azure services. Many of its features are free. It automatically captures telemetry, consolidates it, and makes the data available for interactive querying as well as for a variety of other purposes that we’ll discuss throughout the series. This isn’t quite the whole story, though. While Azure Monitor works well most of the time, and it appears to be the strategic direction that Azure is heading in, there are a number of exceptions, caveats, and complexities – and these become more evident when you try to automate it. I’ll cover some of these in more detail below. Metrics are numeric values that represent a distinct piece of information about a component at a point in time. The exact list of metrics depends on what makes sense for a given service. For example, a virtual machine publishes metrics for the CPU and memory used; a SQL database has metrics for the number of connections and the database throughput units used; a Cosmos DB account publishes metrics for the number of requests issued to the database engine; and an App Service has metrics for the number of requests flowing through. There can be dozens of different metrics published for any given Azure service, and they are all documented for reference. We’ll discuss metrics in more detail throughout the series, as there are some important things to be aware of when dealing with metrics. As well as Azure Monitor’s metrics support, some Azure services have their metrics systems. For example, SQL Azure has a large amount of telemetry that can be accessed through dynamic management views. Some of the key metrics are also published into Azure Monitor, but if you want to use metrics that are only available in dynamic management views then you won’t be able to use the analysis and processing features of Azure Monitor. We’ll discuss a potential workaround for this in part 3 of this series. A similar example is Azure Storage queues. Azure Storage has an API that can be used to retrieve the approximate number of messages sitting in a queue, but this metric isn’t published into Azure Monitor and so isn’t available for alerting or dashboarding. Again, we’ll discuss a potential workaround for this in part 3 of this series. Nevertheless, in my experience, almost all of the metrics I work with on a regular basis are published through Azure Monitor, and so in this series we’ll predominantly focus on these. Resource activity logs are essentially the logs for management operations performed on Azure resources through the Azure Resource Management (ARM) API, and a few other types of management-related logs. They can be interactively queried using the Azure Portal blades for any resource, as well as resource groups and subscriptions. You can typically view these by looking at the Activity log tab from any Azure resource blade in the portal. Activity logs contain all write operations that pass through the ARM API. If you use the ARM API directly, or indirectly through the Azure Portal, CLI, PowerShell, or anything else, you’ll see logs appear in here. More details on activity logs is available here. Azure AD activity logs track Active Directory sign-ins and management actions. These can be viewed from within the Azure AD portal blade. We won’t be covering Azure AD much in this series, but you can read more detail about Azure AD logs here. Diagnostic logs are published by individual Azure services. They provide information about the actions and work that the service itself is doing. By default these are not usually available for interactive querying. Diagnostic logs often work quite differently between different services. For example, Azure Storage can publish its own internal logs into a $logs blob container; App Services provides web server and application logs and can save these to a number of different places as well as view them in real time; and Azure SQL logs provide a lot of optional diagnostic information and again have to be explicitly enabled. Application logs are written by application developers. These can be sent to a number of different places, but a common destination is Application Insights. If logs are published into Application Insights they can be queried interactively, and used as part of alerts and dashboards. We’ll discuss these in more detail in later parts of this series. Azure Log Analytics is a central log consolidation, aggregation, and querying service. Some of the above logs are published automatically into Log Analytics, while others have to be configured to do so. Log Analytics isn’t a free service, and needs to be provisioned separately if you want to configure logs to be sent into it. We’ll discuss it more detail throughout this series. Azure services automatically publish metrics into Azure Monitor, and these built-in metrics are ingested free of charge. Custom metrics can also be ingested by Azure Monitor, which we’ll discuss in more detail in part 3 of this series. As described in the previous section, different types of logs are ingested in different ways. Azure Monitor automatically ingests resource activity logs, and does so free of charge. The other types of logs are not ingested by Azure Monitor unless you explicitly opt into that, either by configuring Application Insights to receive custom logs, or by provisioning a Log Analytics workspace and then configuring your various components to send their logs to that. Once data has been ingested into Azure Monitor, it becomes available for a variety of different purposes. Many of these will be discussed in later parts of this series. 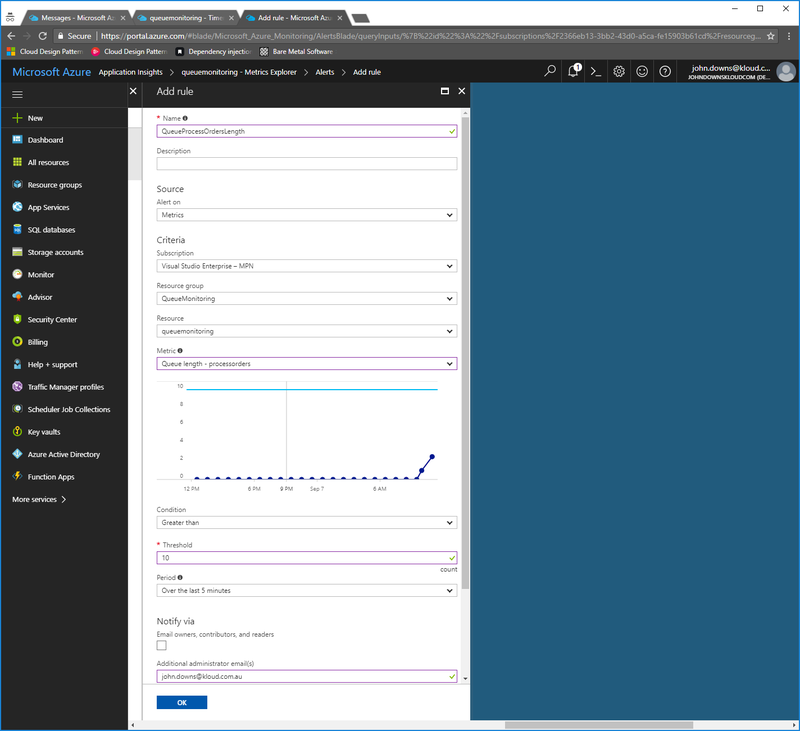 For example, metrics can be used for dashboards (see part 6, coming soon) and for autoscale rules (see part 8, coming soon); logs that have been routed to Azure Monitor can be used as part of alerts (see part 5, coming soon); and all of the data can be exported (see part 9, coming soon). Application Insights has been part of the Azure platform for around two years. Microsoft recently announced that it is considered to be part of the umbrella Azure Monitor service. However, Application Insights is deployed as a separate service, and is billable based on the amount of data it ingests. We’ll cover Application Insights in more detail in part 2 of this series. Azure Monitor is the primary instrumentation service we generally interact with. Azure Monitor captures metrics from every Azure service, and it also captures some types of logs as well. More detailed diagnostic and activity logging can be enabled on a per-service or per-application basis, and depending on how you configure it, it may be routed to Azure Monitor or somewhere else like an Azure Storage account. Custom data can be published into Azure Monitor through custom metrics (which we’ll cover in part 3 of the series), through publishing custom logs into Log Analytics, and through Application Insights. Application Insights is a component that is deployed separately, and provides even more metrics and logging capabilities. It’s built off the same infrastructure as the rest of Azure Monitor and is mostly queryable from the same places. 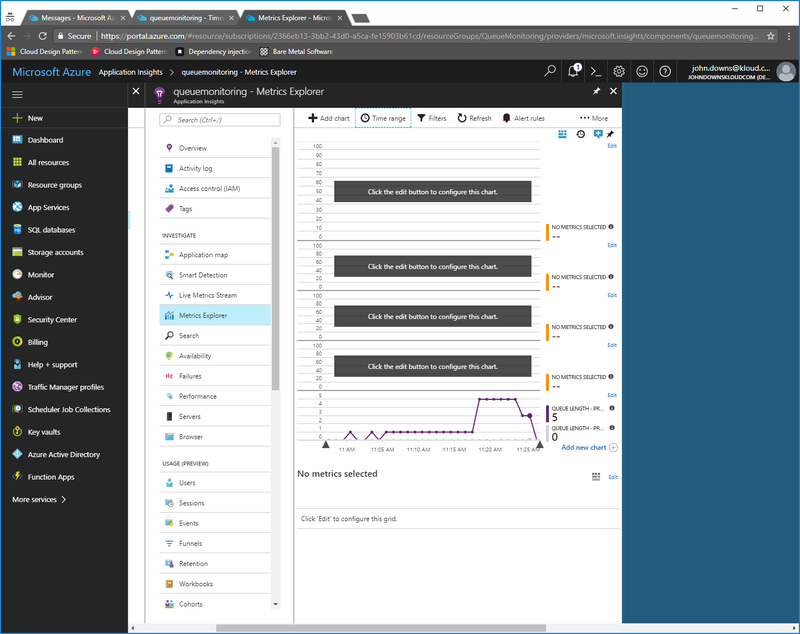 Once telemetry is published into Azure Monitor it’s available for a range of different purposes including interactive querying, alerting, dashboarding, and exporting. We’ll cover all of these in more detail throughout the series. The idea of automating all of our infrastructure – scripting the setup of virtual machines or App Services, creating databases, applying schema updates, deploying our applications, and so forth – has become fairly uncontroversial. The benefits are so compelling, and the tools are getting so good, that generally most teams don’t take much convincing that expressing their infrastructure as code is worthwhile. But in my experience working with a variety of customers, I’ve found that this often isn’t the case with instrumentation. Instrumentation components like dashboards, alerts, and availability tests are still frequently seen as being of a different category to the rest of an application. While it may seem perfectly reasonable to script out the creation of some compute resources, and for these scripts to be put into a version control system and built alongside the app itself, instrumentation is frequently handled manually and without the same level of automation rigour as the application code and scripts. As I’ll describe below, I’m not opposed to using the Azure Portal and other similar tools to explore the metrics and logs associated with an application. But I believe that the instrumentation artifacts that come out of this exploration – saved queries, dashboard widgets, alert rules, etc – are just as important as the rest of our application components, and should be treated with the same level of diligence. Reducing risk of accidental mistakes: I find that expressing my instrumentation logic explicitly in code, scripts, or ARM templates makes me far less likely to make a typo, or to do something silly like confuse different units of measurement when I’m setting an alert threshold. Peer review: For teams that use a peer review process in their version control system, treating infrastructure as code means that someone else on the team is expected to review the changes I’m making. If I do end up making a dumb mistake then it’s almost always caught by a coworker during a review, and and even if there are no mistakes, having someone else on the team review the change means that someone else understands what’s going on. Version control: Keeping all of our instrumentation logic and alert rules in a version control system is helpful when we want to understand how instrumentation has evolved over time, and for auditability. Keeping related changes together: I’m a big fan of keeping related changes together. For example, if I create a pull request to add a new application component then I can add the application code, the deployment logic, and the instrumentation for that new component all together. This makes it easier to understand the end-to-end scope of the feature being added. If we include instrumentation in our ‘definition of done’ for a feature then we can easily see that this requirement is met during the code review stage. Managing multiple environments: When instrumentation rules and components aren’t automated, it’s easy for them to get out of sync between environments. In most applications there is at least one dev/test environment as well as production. While it might seem unnecessary to have alerts and monitoring in a dev environment, I will argue in part 2 of this series that it’s important to do so, even if you have slightly different rules and thresholds. Deploying instrumentation as code means that these environments can be kept in sync. Similarly, you may deploy your production environment to multiple regions for georedundancy or for performance reasons. If your instrumentation components are kept alongside the rest of your infrastructure, you’ll get the same alerts and monitoring for all of your regions. Avoid partial automation: In my experience, partially automating an application can sometimes result in more complexity than not automating it at all. For example, if you use ARM templates and (as I typically suggest) use the ‘complete’ deployment mode, then any components you may have created manually through the Azure Portal can be removed. Many of the instrumentation components we’ll discuss are ARM resources and so can be subject to this behaviour. Therefore, a lack of consistency across how we deploy all of our infrastructure and instrumentation can result in lost work, missed alerts, hard-to-find bugs, and generally odd instrumentation behaviour. Having an instrumentation-first mindset doesn’t mean that we can’t or shouldn’t ever use the Azure Portal. In fact, I tend to use it quite a lot – but for specific purposes. First, I tend to use it a lot for interactively querying metrics and logs in response to an issue, or just to understand how my systems are behaving. I’ll use Metrics Explorer to create and view charts of potentially interesting metrics, and I’ll write log queries and execute them from Application Insights or Log Analytics. Second, when I’m responding to alerts, I’ll make use of the portal’s tooling to view details, track the status of the alert, and investigate what might be happening. We’ll discuss alerts more later in this series. Third, I use the portal for monitoring my dashboards. We’ll talk about dashboards in part 6 (coming soon). Once they’re created, I’ll often check on them to make sure that all of my metrics look to be in a normal range and that everything appears healthy. Fourth, when I’m developing new alerts, dashboard widgets, or other components, I’ll create test resources using the portal. I’lll use my existing automation scripts to deploy a short-term copy of my environment temporarily, then deploy a new alert or autoscale rule using the portal, and then export them to an ARM template or manually construct a template based on what gets deployed by the portal. This way I can see how things should work, and get to use the portal’s built-in validation and assistance with creating the components, but still get everything into code form eventually. Many of the ARM templates I’ll provide throughout this series were created in this way. Finally, during an emergency – when a system is down, or something goes wrong in the middle of the night – I’ll sometimes drop the automation-first requirement and create alerts on the fly, even on production, but knowing that I’ll need to make sure I add it into the automation scripts as soon as possible to ensure everything stays in sync. This post has outlined the basics of Azure’s instrumentation platform. The two main types of data we tend to work with are metrics and logs. Metrics are numerical values that represent the state of a system at a particular point in time. Logs come in several variants, some of which are published automatically and some of which need to be enabled and then published to a suitable location before they can be queried. Both metrics and logs can be processed by Azure Monitor, and over the course of this series we’ll look at how we can script and automate the ingestion, processing, and handling of a variety of types of instrumentation data. Automation of Azure Monitor and other instrumentation components is something that I’ve found to be quite poorly documented, so in writing this series I’ve aimed to provide both explanations of how these parts can be built, and set of sample ARM templates and scripts that you can adapt to your own environment. In the next part we’ll discuss Application Insights, and some of the automation we can achieve with that. We’ll also look at a pattern I typically use for deploying different levels of instrumentation into different environments. An organisation used to invest their IT infrastructure mostly for computers, network or data centre. Over time, they spent their budget for hosting spaces. Nowadays, in cloud environments, they mostly spend their funds to purchase computing power. 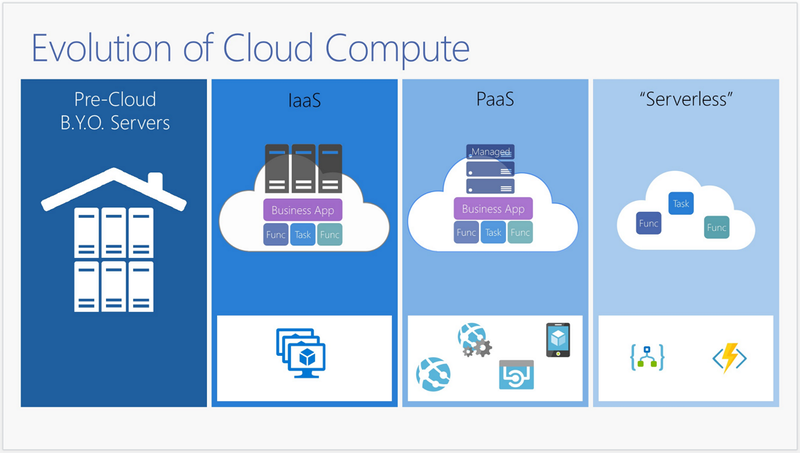 Here’s a simple diagram about the cloud computing evolution. From left to right, expenditure shifts from infrastructure to computing power. In the cloud environment, when we need resources, we just create and use them, and when we don’t need them any longer, we just delete them. But let’s think about this. If your organisation runs dev, test and production environment on cloud, the cost of resources running on dev or test environment is likely to be overlooked unless carefully monitored. In this case, your organisation might be receiving an invoice with massive amount of cost! That has to be avoided. In this post, we are going to have a look at the Azure Billing API that was released in preview and build a simple application to monitor costs in an effective way. The sample codes used for this post can be found here. There are two distinctive APIs for Azure Billing – one is Usage API and the other is Rate Card API. Therefore, we can calculate how much we spent during a particular period. This API is based on a subscription. Within a subscription, we can send a request to calculate how much resources we used in a specified period. Here are the parameters we can use for these requests. ReportedStartTime: Starting date/time reported in the billing system. ReportedEndTime: Ending date/time reported in the billing system. Granularity: Either Daily or Hourly. Hourly can return more detailed result but takes far longer time to get the result. Details: Either true or false. This determines how usage is split into instance level or not. If false is selected, all same instance types are aggregated. Here’s an interesting point on the term Reported. When we USE cloud resources, that can be interpreted from two different perspectives. The term, USE, might mean that the resources were actually used at the specified date/time, or the resource used events were reported to the billing system at the specified date/time. This happens because Azure is basically a distributed system scattered all around the world, and based on the data centre the resources are situated, the actual usage date/time can be reported to the billing system in a delayed manner. Therefore, even though we send requests based on the reported date/time, the responses containing usage data show the actual usage date/time. When you open a new Azure subscription, you might have noticed a code looking like MS-AZR-****P. Have you seen that code before? This is called Offer Durable ID and, based on this, different rates on resources apply. Please refer to this page to see more details about various types of offers. In order to send requests for this, we can use the following query parameters. Therefore, in order to calculate the actual spending, we need to combine these two API responses. Fortunately, there’s a good NuGet library called CodeHollow.AzureBillingApi. So we just use it to figure out Azure resource consumption costs. Kloud, as a cloud consulting firm, offers all consultants access to the company’s subscription without restriction so that they can create resources to develop/test scenarios for their clients. However, once resources are created, there’s high chance that those resources are not destroyed in a timely manner, which brings about unnecessary cost spending. Therefore, management team has made a decision to perform cost control by resource groups 1) assigning resource group owners, 2) setting total spend limit, and 3) setting daily spend limit, using tags. By virtue of these tags, resource group owners are notified via email when cost approaches 90% of the total spend limit, and when it reaches the total spend limit. They also get notified if the cost exceeds the daily spend limit so they can take appropriate actions for their resource groups. Sounds simple, right? Let’s code it! When the application is written, it should be run daily to aggregate all costs, store it to database, and send notifications to resource group owners that meets the conditions above. The common libraries consist of three parts. Firstly, it calls Azure Billing API, and aggregates data by date and resource group. Secondly, it stores those aggregated data into database. Finally, it sends notification to resource group owners who have resource groups that exceeds either total spend limit or daily spend limit. First of all, like the code above, we need to fetch all resource usage/cost data then, like below, those data needs to be grouped by dates and resource groups. We now have all cost related data per resource group. We then need to fetch tag values from resource groups using another API call and merge it with the data previously populated. We can look up all resource groups in a given subscription like above, and merge this result with the cost data that we previously found, like below. This is the simplest part. Just use Entity Framework and store data into the database. We’ve so far implemented data aggregation part. First of all, we need to fetch resource groups that meet conditions, which is not that hard to write. The code above is self-explanatory: it only returns resource groups that 1) approach the total spend limit or 2) exceed the total spend limit, or 3) exceed the daily spend limit. It works well, even though it looks smelly. The following code bits show how to send notifications to the resource group owners. It only writes alarms onto the screen, but we can implement SendGrid for email notification or Twillio for SMS alert, in here. Now we’ve got the basic application structure. How can we execute it, by the way? 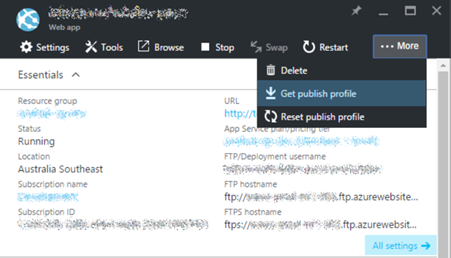 We might have two approaches – Azure WebJobs and Azure Functions. Let’s move on. A console application might be the simplest way for this purpose. Once the console app is built, it can be deployed to an Azure WebJob straight away. Here’s the simple console application code. Aggregator service collects and store data and Reminder service sends alerts to resource group owners. In order to deploy this to Azure WebJob, we need to create two extra files, run.cmd and settings.job. run.cmd: When this WebJob is run, it always looks up run.cmd first, which is a simple batch command file. Therefore, if necessary, we can enter the actual executable command with appropriate arguments into this file. That’s how we can use Azure WebJob for monitoring. Basically, this app runs for 1-2 minutes at the shortest or 30-40 minutes at the longest. This execution time is not affordable for Consumption Plan, which charges costs based on execution time. On the other hand, as we have already paid for App Service Plan, we don’t need to pay extra for the Function instance, if we create it under the App Service Plan. Here we have shown how to quickly write a simple application for cost monitoring, using the Azure Billing API. Cloud resources can certainly be used effectively and efficiently, but the flipside of it is, of course, that we have to be very careful not to be wasteful. Therefore, implementing a monitoring application would help in preventing unwanted cost leak.